Joanna Dees Leavitt, 80, passed away in her home surrounded by family June 8, 2016. Joanna was born and raised in Mesa. She served in many capacities as a member of The Church of Jesus Christ of Latter-day Saints, including Primary President, Relief Society teacher, Compassionate Service Leader, and lifelong Visiting Teacher. In 1955 Joanna married her eternal companion, Laurel D. Leavitt, who preceded her in death in 2007. They spent their early life on the University of Arizona Experimental Farm, where they raised their 6 children. A homemaker and entrepreneur, Joanna enjoyed selling World Book encyclopedias, tomatoes, and hay from their later home near Westwood High School. Joanna was well known for her strong faith in and love for Heavenly Father and Jesus Christ. Her family claims that her prayers were a hotline to Heaven. 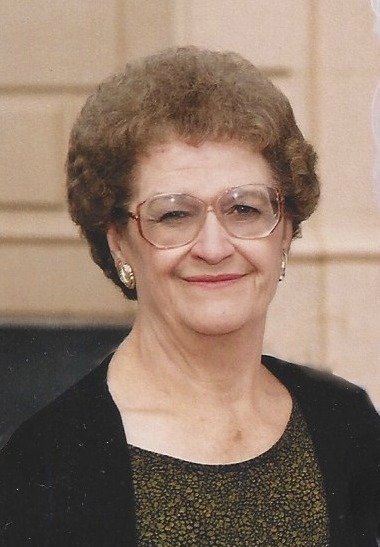 She had many passions and hobbies, including finding great deals, finishing crossword puzzles, and singing happy birthday medleys to her 27 grandchildren and 22 great grandchildren. Joanna is preceded in death by her parents, R. Preston Dees and Zina Adell Harper Dees; her brothers, Darwin, Varis and Naris; and her sister Naydell Ball. She is survived and missed by her two sisters, Arthella Berg and Ludene Carling, and brother, Leslie Rice; as well as her children: Laurel Ann (Eric) Strate, Linda (Stephen) Hartmann, Sterling (Sheleen Rogers), Wayne (Charlys Swift), Suzanne (Kevin) Shreeve, and Brent (Jenni Giles). Viewings will be on Friday, June 17 from 6 to 8 PM and Saturday, June 18 from 8:30-9:30 AM. Funeral services will be held Saturday, June 18 at 10 AM. Viewings and funeral will be held at the LDS Maricopa Stake Center, 611 N. Stewart, Mesa, AZ 85201. So sorry to hear of your loss. Remembering all of you in my prayers at this time. So sorry for the loss of your mother, friend and grandmother. She was always so friendly to me and always had a smile on her face.. We are sorry that we will miss the funeral. Sending hugs your way! So sorry to hear of her passing earlier this week. She is a stalwart woman and great example to all of her friends and family. I know she will be deeply missed by all who knew her. May you each hold sweet memories of her. From Stuart and I and our entire family we offer our thoughts and prayers for each of you. I know that you know and I’m sure you will hear this from hundreds, but I will say it anyway; your mother was and still is a very wonderful, thoughtful, kind and generous person, and much more. Truly an elect lady. We loved her very much. Our families were friends even before she was born so she is honestly someone I have known all of my life. She has been a special friend and for the past 42 years a wonderful neighbor as well. I appreciate all she has done, and the wonderful example she set for me and my family. How grateful I am for the Gospel. To know we will see our loved ones again is the greatest comfort I find at such times. Joanna was like a mother to me. I would drop in to see how she was doing, she was always thrilled to see me. We would sit and visit together. She always wanted to know how I was doing and if my children were ok. When I left to go back to Eagar for the summer I would send her postcards of the White Mountains. When I got back to Mesa she had my cards on her wall. She was always so happy to see me at Church, she was the best friend I had in the ward. Sometimes we ate dinner at her home and watch the Diamond Backs play, she taught me about them. We bonded quickly as friends because of our background in farming, I grew up on tractors. Before I knew her I would drive by her home just to see the farm equipment in her yard. I was her visiting teacher. She told me she was memorizing the Twelve Articles of Faith. I giggled as she repeated them to me because I knew she had such a deep testimony. Sometimes as we visited her husband would be in the kitchen helping a man who looked homeless. This reminded me of my father always bringing home people who needed a meal and a bed. Being in the Leavitts home was like going home. The last time I said good bye to her in her home I bent over kissing her on the head as she sat in her wheelchair and told her I loved her. She was always so cheerful. I wasn’t ready to let my sweet friend go. No one will take her place. We are so sorry for your loss. Just know our love and prayers are with your sweet family. Loved your mom – I always got she and sister Carling confused, but she never got me confused with anyone (even though share same name as her niece) – the world is truly going to miss Joanna!! I have so a lot of special memories of Joanna. She always had a smile on her face. Loved being around her. My thoughts and prayers go to her family. Oh, I’m so sorry to hear of Joanna’s passing. What a lovely, special person she was, always so thoughtful and compassionate. Wish I were closer so i could drop in and give you all hugs. The Leavitt family have a great heritage, wonderful parents–strong faithful loving and ever living an example to others. My love to all of you. Suzanne, I am so sorry. ❤ I totally understand that you miss her already. Our moms are such special gifts in our life. We love your family and will miss Joanna so much. I’ll never forget the time she called me when she was doing a crossword puzzle to ask me the capital of Zimbabwe because she knew we had gone on a mission there and would know the answer. She was a very special woman and raised a very special family. Love to all of you! I send you my most deepest love and condolences at the passing of your angel mother. She is truly one of God’s gifts to those who have the blessing of knowing her. May your hearts be filled with the joy of her life and love for each of you. We were saddened at the news of your mother’s passing. She is was a wonderful, caring, strong woman. I know you will missed her terribly. Things will never be the same, but it’s so comforting to know she is with your dad. Sorry we will not be at the funeral to honor her memory. I am so sorry for the loss of such a wonderful person. She will be missed by everyone that knew her. Always a smile on her face and a welcome to anyone who came around. There is one thing for sure her sweet husband is happy to have her there with him. What a blessing the gospel is. I tried to get in contact with her two weeks ago, called everyone I had a number for, and got nowhere. No one still had the numbers I called. May Heavenly Father bless all of you, Leavitt Family, at this time, and always. Joanna and Laurel were a great force for good in many lives, including mine and my children. Joanna always made me feel like somebody special. She will be missed, but her influence will last for generations. Wish I could have been at her services. Many condolences. I am sorry it took me so long to find this site. I loved Sis Leavitt and the Leavitt family. I was always treated as one of the family when I visited. I always knew i could get a huh from Sister Leavitt and understanding from her for what ever was going at the time. I miss her and look forward to to seeing heragain!